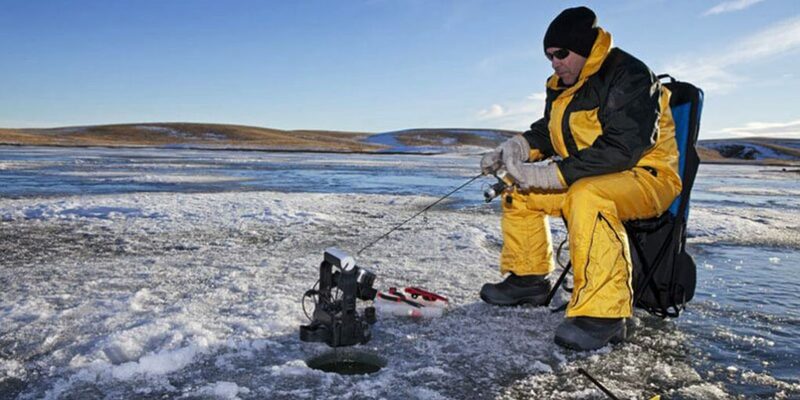 The best way to maximize your chances of succeeding in ice fishing is by working with the right kind of fishing gear. Talking about gear, ice water can be difficult to analyze from above due to the thick layer of ice that typically hovers above it. This is where specialized tools such as the best ice fishing fish finders come in handy. Such finders are particularly designed to function optimally even under challenging conditions. Not all fish finders you come across out there have what it takes to excel. With that in mind, here are the 10 options compared in a quick but exhaustive chart. LX-7 Marcum is an advanced ice fishing sonar that has taken fishing technology to another level. The gadget has transformed ice fishing with its many features. For instance, the LX-7 promises to increase fishing accuracy by about 200%. It’s no wonder it is best suited for both deep and shallow water fishing. You can easily do ice fishing and know which fish is targeting your bait without guessing. It has a large screen. The dimensions of the display screen are 8-inch LCD (800 x 600px). You can be assured of sharp images with this resolution. It also offers four color palettes to select from. Anglers have so many features to choose from in this unit. The dashboard is customizable. You can also have up to three window displays at the same time. In addition, you can zoom images. The LCD sonar feature is quite real time and generates images almost immediately using an 8° or 20° transducer cone angles. The units specialized sonar feature can display the bottom waters at all depth and provide images on the screen immediately. The dashboard is user-defined and can display battery voltage, range, interference rejection (IR), gain, target adjust. The package includes a protective shield, transport shuttle and a dual-beam transducer that is easily adjustable. However, it is quite expensive. 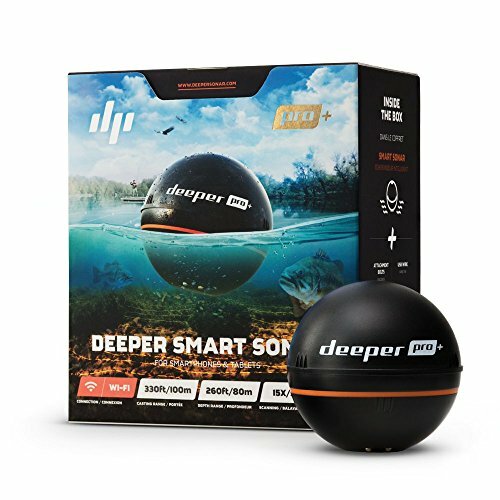 Deeper Smart Sonar is a fish-finder with state of the art technology. The device uses wireless connections (Wi-Fi) to connect with your tablet or smartphone. It has an advanced high-frequency system which provides more accurate fishing data. It is built to capture many fishing details that are important to an angler to make decisions. These include temperature, depth, vegetation, mark fish, and water columns. It then streamlines the information to your smartphone or tablet. In addition, it is uniquely designed. It comes in color black, in a ball-like shape with an orange line. It has a GPS mode operating using bathymetric technology which provides bottom contour data and maps to help in your navigation when fishing, therefore, helping you to find the best fishing spots. More importantly, it is quite affordable. The sonar can be used in varied fishing waters, deep waters or shallow, salt water or fresh waters or ice fishing. However, it is important to note that the device is limited in that it has to work with a smartphone or tablet. It requires a smartphone to streamline data. This device will improve your overall fishing experience, and help you catch more fish by helping you to know the best fishing spots. Its sonar beam reaches both wide and deep waters providing accurate fishing data about the fish size, where they are located among others. It uses fiber-optic connections with a six-color flasher with LCD. It has a big screen providing excellent views of what is happening under the water, beneath the icy waters. Some of the features on this device include noise reduction function, excellent zoom features and scanning depth, dual frequency. The noise reduction function minimizes interference by other units in your fishing area. The package includes an ice fishing flasher bag for the convenience of storage and transport. The device is not cheap and requires digging deep into your pocket. It has other two models with slightly different features to choose from, namely Ice-35 and Ice-45. 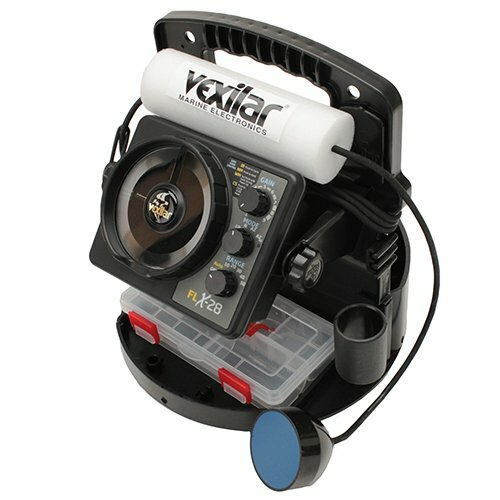 A very budget friendly fish finder with great features. 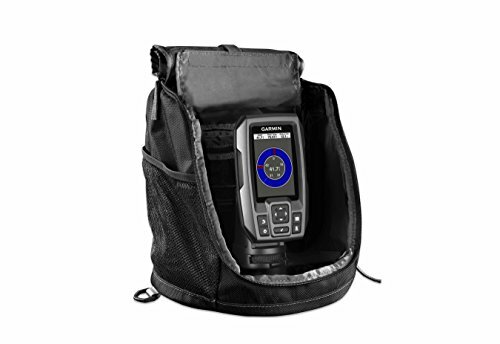 It is a portable fish finder with an LCD display. In addition, it has a transducer for sensing sonars. It can be used in various fishing waters including sea, lake or river, and has a depth range between 3ft and 328 ft. It can display water depth, provide information on what is underwater, for example, tall or short weeds, rocky or sandy bottom. The unit has five levels of sensitivity, but when the sensitivity is low, it is only able to provide data on big fishes. It comes with a round transducer that has a 25 feet cable and makes it ideal for ice fishing, dock or boat fishing. However, it is limited and only provides basic fishing data. It can provide approximates and not accurate data in some instances. 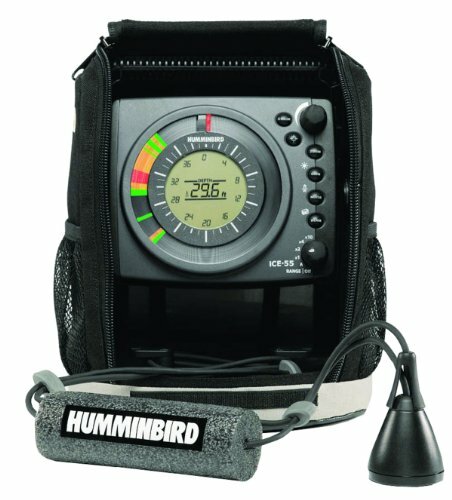 An all year round fish finder. It makes ice fishing easier. The unit is popular for its three-color flasher displaying green for weak targets, orange color for medium targets while strong targets are shown in red. It has a sunlight viewing feature called super-bright LED technology. The unit can give the depth of the lake details plus finding fish. Some of the features on the ice flasher were specially designed by the world’s greatest Ice fisherman Dave Genz. He designed the holding case to be multi-functional. The package includes a 12-volt battery, charger, and a 19-degree ice-Ducer transducer. The fish finder has special features to make it an all year fish finder/flasher. It includes rejection interference, six depth ranges, super bright LEDs, and 525 segments of resolution. More importantly, it has an instructional video. Easy to read LED display even in bright sunlight. So many features are incorporated in the FLX-28 Vexilar than has ever been designed in a single flasher sonar system before. It makes ice fishing fun. It is an improvement of the FL-8se model. Targeting certain fish species is easy. It has a 300 feet depth coverage. The depth is displayed digitally. Worth noting is that most fish finders that provide accurate data all year round cost an arm and a leg. This is no exception. It is built sturdily. The design allows multiple attachments on it. You can fit an ice-ducer on it or rod holder. It has a long battery life with battery details displayed on the screen. The low power mode saves battery power when in shallow waters. It provides five color palettes and 525 resolution lines. It has excellent data transfer technology. The unit is portable and comes with a case for travel and safe storage. Other features include two zoom areas, day and night modes, special weed fishing mode. Garmin 4 Strike is great for ice fishing, canoe or kayak because it is portable. The unit comes with a built-in high-sensitivity GPS, which helps in navigation. You can use it to mark spots and come back to them in the future using waypoints. It indicates the speed of the boat on the screen. This helps you to do better target fishing because different species of fish are sensitive to different speeds. Also, the Striker does a good job of tapping into the CHIRP sonar technology for a greater performance at separating the targets. You can choose from three models with different display sizes 3.5-, 5- and 7-inch. It is reasonably priced compared to other models. However, the screen size is small. The package includes CHIRP (77/200 kHz) transducer, a rechargeable battery, trolling motor mounting kit, tilt/swivel mount and transom kit, and a carrying case. Though it is portable, the battery is not waterproof and has to be protected. A great device that will enhance your fishing experience. It will help you find great fishing spots and also do target fishing. It does this using way mapping. The device has a backtrack feature for scrolling back to check past images, and you can choose spots you may want to revisit using GPS technology. It combines the use of CHIRP and Downscan Imaging technology. The CHIRP sonars will give you a good view of the underwater properties under your boat. It will help you distinguish between fish and weeds. The accurate GPS has many features. It is fast. You can save your GPS history to use at a later date. You can also, set a GPS alarm. In addition, you can record and read water temperatures. It comes installed with an excellent GPS technology provided with base maps. The Insight Genesis Maps allows you to modify your maps collection. The device has many features to offer an angler requires time to learn how it functions. FL-18 Vexilar is an advanced sonar system and the first model to have a split-screen display. It is an essential equipment when looking at fish targets in deep waters. Perfect for ice fishing and open water fishing. It is easy to operate the device because of learning how three buttons on the unit function. Using the AZ mode zoom feature, you can zoom in the water six feet under while being able to view the water under with perfect resolution. When fishing in shallow waters(less than 10 feet), you can use the low power mode to save your battery power. Worth noting is that the unit has state of the art technology to enhance your fishing experience, but it all comes at a high cost. The unit is quite pricey. It has a bottom-lock feature. The unit stays locked at the bottom at all times, whether the boat is bouncing or not. Easy to operate. It has only three buttons operating it. One of the most expensive units in the market. 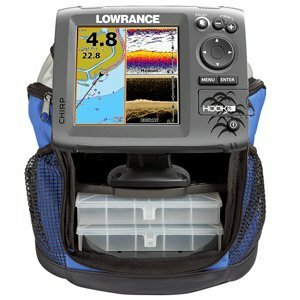 Lowrance Elite-3X is designed with advanced features in a color display unit at an affordable price. The unit is perfect for beginner anglers. The unit has a 5″ color LCD screen with a LED-backlit color display. Therefore, the screen can be viewed when it’s very sunny from various angles. It comes with an 83/200 transducer. It provides accurate data that will help you do target fishing efficiently because of the transducer. The transducer is placed in the water to relay signals to the fish finder. 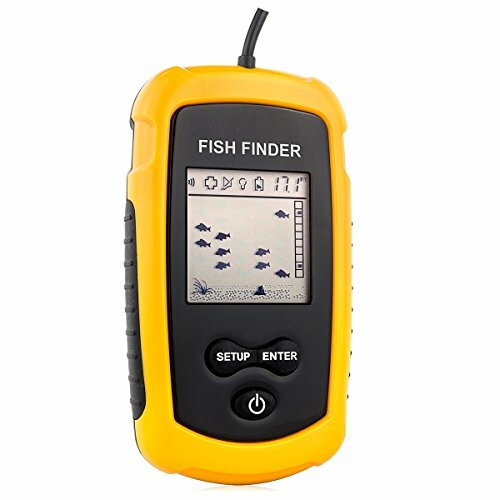 The fish finder will transmit the data to you in its display screen. It uses a mapping sequence which shows the location of the fishes. It is the first mode to be launched in a series. Elite-4x and Elite-5x are improved models. It takes a discerning eye to differentiate between a well-marketed below-par finder and a genuinely good unit that sits pretty on the market. To help you be in a position to make this decision, here are the pointers to keep in mind. If you can find a unit that uses your smartphone’s screen to show you the details beneath the waters, that’d be great. Otherwise, some professional anglers prefer to settle for the traditional finders with a limited screen display. Ultimately, your style of fishing and level of confidence should dictate the choice you settle for. Devices with a high wattage level tend to achieve faster readings. Fewer watts often lead to slow readings. That said, if you’re worried about battery consumption, you can always go for the unit with fewer units and put up with slower readings. Some additional features to look out for include built-in handheld GPS functionalities. Also, some finders come with the ability to determine the water temperature but others don’t. Luckily, you don’t always need a huge variety of extras to excel. So if you’re on a tight budget, there’s no harm in settling for a minimalistic unit. 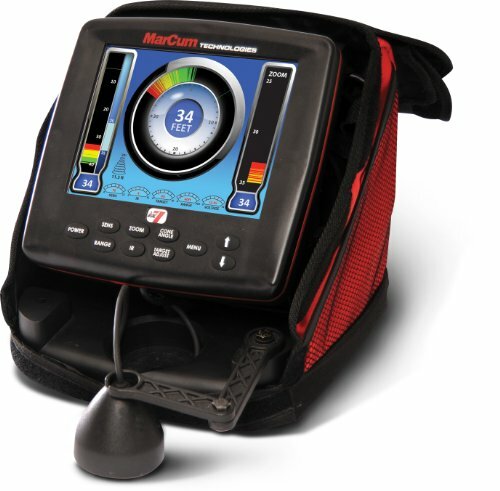 In terms of the favorite ice fishing fish finder, we’d settle for the Marcum LX-7. It’s quite solid and reliable when used in frozen waters. However, if you’re looking for something that works perfectly with your smartphone, go for the Deeper Smart Sonar. Haven’t had much luck in finding a reasonably priced ice fishing fish finder? We hope that this reviews article will help you end that search. Ultimately, we hope that the unit you choose to invest in today will help you double or even quadruple your fortunes at sea!